Strong and Durable: uses a high-quality 4mm aluminum material similar CNC technology as Macbook adopts, and thickness reachs 4mm,not easily deformed. Foldable and Portable: provides multiple viewing angles for your laptop and it convenient to carry,just put the laptop in laptop bag, brieftcase, handbag, great for daily carry and travel, wherever you go. Protection Design: Soft protective silicone pad around the edge can prevent your MacBook, laptop or tablet from scratches and slipping, keep it always in the right secure place.suitable for playing games, home or office usage. 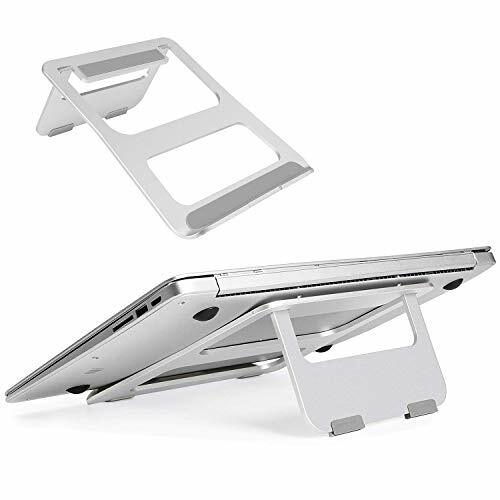 The laptop stand fit for all sizes of Apple MacBook / Macbook Air / Macbook Pro / iPad Pro/Tablets / Powerbook and most 12-17 inch laptops notebooks. Compatible For Various Laptops：Fit for laptops up to 17 inches: Macbook, Macbook Air, Macbook Pro and many other notebook computers. If you have any questions about this product by CreaDream, contact us by completing and submitting the form below. If you are looking for a specif part number, please include it with your message.